The U23+3 football team have been awarded nearly $190,000 in total after being qualified for the men’s semi-final of the Asian Games. 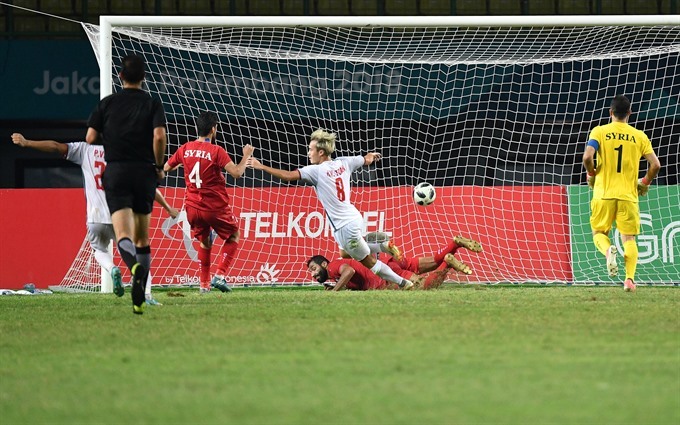 Viet Nam’s Nguyen Van Toan (C) shoots to score against Syria during the quarter-final men’s football match with Syria during the 2018 Asian Games in Bekasi on August 27, 2018. In order to celebrate Olympic Viet Nam’s victory and encourage them to try their best in the next matches, coach Park Hang-seo and his team were previously awarded US$94,941 from Radio the Voice of Viet Nam (VOV), the Viet Nam Football Federation (VFF) and the Minister of Culture, Sports and Tourism Nguyen Ngoc Thien. Later, on Monday night, the whole team were awarded $25,894 from VFF, $21,578 from the Viet Nam Olympic Committee, $21,578 from VOV and $25,894 from an electronics company.